The guns covered are Remington Model 700, Seven, Sportsman 78, 673, 710, 715, 770, 600, 660, XP-100, 721, 722, and 725. The problem is some examples of these guns firing when the trigger is not pulled. Surely you do not want that to happen. Quit using your Remmies. Send them in for the free overhaul. I gave this story some coverage in the past, saying that I would send in my rifle, but also pointing out that media coverage may have given an exaggerated idea of the prevalence of the problem, and little or no attention to possible contributing factors in the accidents reported. I also pointed out that uncommanded firing can occur in other brands. It may be that other lawsuits, against smaller makers, will be along in the wake of this successful settlement. A cynical view of the matter is that giant Remington was singled out for their deep pockets. I noted in my past coverage that the Marine Corps encountered the problem. (Their M40 and its variants are 700's adapted to the Corps's preferences.) They addressed the matter by telling the grunts to quit messing with the trigger settings. It is a mistake for Marines (or anyone else) to try to make a hair trigger out of a field trigger. It is not necessary for good accuracy and it is not safe. Another possible contributing problem is dirt, gummed oil and so on: Cleanliness is related to functionality, in any gun. In any event, Remington is replacing the triggers with something new and improved, so get on board. Remington has not acknowledged blame but settled to avoid further litigation. That, I find, is a common face-saving way for product lawsuits to end. "I don't know just what it is, but I'll let you have it cheap." So said the fellow at the gun show, and that is how I came to have this thing in my collection. The Singlepoint is an ancestor of today's red dot sights. It created a stir back in the seventies. It was discussed in the English Parliament. Its moment of fame came on the Son Tay raid in the Vietnam war. It even got writeups in Popular Mechanics and Popular Science, honors reserved for things that were maximally cool. By modern standards, though, it's a pathetic gunsight. It was a good try for its time, no doubt. It is an occluded eye gunsight (OEG), meaning you can't see through it. When you look in the end you see a black field with a red dot floating in it. You look at the target with your other eye and your brain merges the two images into one. Thus, you see the red dot superimposed upon the target. The Contender is a break action single shot. You can set up the gun as a pistol or carbine, depending on your tastes. 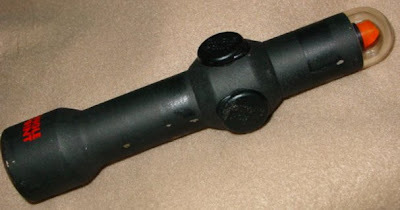 Barrels are interchangeable and available in many calibers. The gun reviewed is an older model, made in the seventies. There is a more recent "G2" second generation model with numerous changes to the mechanism. In between the early model shown and the present G2, there were several variations in parts and design, most significantly a redesign of the barrel latch to make the gun easier to open. The review gun lacks the easy-open feature. More about that later. I like automatic pistols just fine. I have shot quite an assortment of them and own some nice ones. But, as I have mentioned elsewhere, I find the double action revolver a friendlier piece of machinery, more convenient all around. A wheel gun is adequate for most purposes, so that is what I'll reach for most every time. 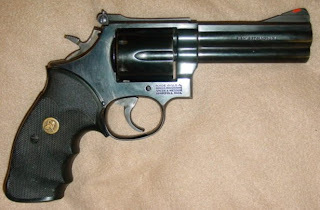 Someone, though, thought this old S&W an inadequate weapon and obsolete; it was a police trade-in from the era when departments in droves were abandoning their revolvers and buying automatics. Those were great days if you liked revolvers; you could get good ones very cheap. This one sold off cheaper than most. It had big patches of holster wear on barrel and cylinder, down to bare pitted metal, and there were some stains and rust freckles in the bluing that remained. The wooden grips were chipped and the varnish was peeling off of them. The elusive "flash sight picture"